Adventure, Explore and Dig on a real Archaeological Excavation...As seen on TV! Experience Day Packs can be bought at any time (often as birthday or Christmas presents) and are valid for at least one year. Dates for the Experience Days will normally be available between the start of April until the end of October, and dates can be booked at a later time. Group bookings can also be made and tailored to meet your needs. Explore the Lost City of Trellech, once the largest Medieval City in Wales, set in the heart of the Welsh countryside. ​Take part in the adventure and discover for yourself ancient relics on the excavation of this forgotten city. This archaeological adventure will take you on a journey into the past. You will be given equipment and guidance to help you uncover lost artefacts that have not seen the light of day for hundreds of years. The day will begin with a site tour at which you will be given your diggers packs. After which you can start digging and hopefully find some lost treasures. ​After lunch (not included) you will have the opportunity to wash some of the finds including your own discoveries and take part in identifying various artefacts already found. You may also choose to carry on with the excavation at your leisure. The diggers packs include a 4-inch archaeological trowel and a kneeling mat to help aid you in your excavation. A pamphlet detailing the story of Trellech, the reason for its growth and eventual decline as well as how it was rediscovered just a few years ago. Also included in the pack is a genuine piece of Medieval iron slag that was created in Trellech over 700 years ago. All this provided in a presentation pack for you to keep. Also at the end of the day you will receive a personal certificate as a memento. All of this is available to anyone of any age – no restrictions. No experience necessary as all guidance is provided by on site archaeologists. You will receive confirmation of your purchase, with information about the Experience Day itinerary. A gift voucher is also included confirming that you have bought an experience day plus diggers pack, together with information on how to book your date. The site is open all year round so you can book for any available day although it is advised to book between the start of May to the end of October when the weather is better. Gift vouchers are normally valid for 12 months from date of purchase. 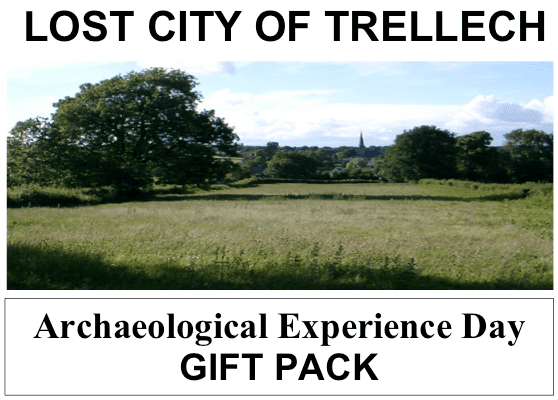 Discovered a few years ago the site of the Lost City of Trellech lies in the heart of the Welsh countryside between the medieval market towns of Monmouth and Chepstow on the hills above the Wye valley. Once of largest city in Wales it now lies in fields just outside the village of Trellech that is situated on its northern edge. An industrial town producing iron principally for the De Clares army it began life in 1245 A.D. and grew rapidly to become approximately ¼ the size of London. The death of the De Clares in 1314 weakened it and the subsequent effects of climate change, plague and war saw it decline further. The present site is part of an ongoing excavation. Already the foundations of several houses including one manor house with a round tower and well have been discovered. All the buildings so far have been built in stone and may well have given the city its name of Trellech, Tre meaning town and llech meaning stone, i.e stone town. Substantial remains exist which allow both the archaeologist and the visitor to gain a good idea of how things would have existed. Numerous finds have also been uncovered and continue to do so. Discoveries have included a nearly complete pot over 600 years old, leather shoes, wooden objects, bronze buckles, including a buckle glided in gold as well as numerous pieces of pots, iron and stone. The Experience Day itselfs lasts for a single day. However, visitors often like to stay in the local area to explore the site and the local area more. Indeed, you may find yourself hooked with the Archaeological bug! If you would like to stay in the local area, there are a number of options provided on the Accommodations page and provided in the welcome information that will be sent to you. When you purchase (for yourself or as a gift) you will immediately receive a gift voucher confirming that you have bought an Experience Day (date to be mutually agreed) and diggers pack, along with an information booklet. Experience days can take place at anytime of the year but you are advised to book early to avoid disappointment.